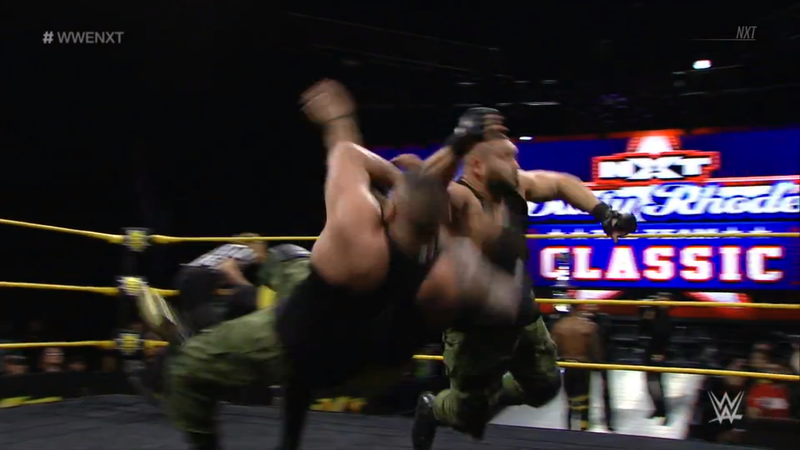 Dusty Rhodes Tag Team Classic Semifinals match: The Street Profits VS The Authors of Pain w/ Paul Ellering; The AoP win and advance to the finals. 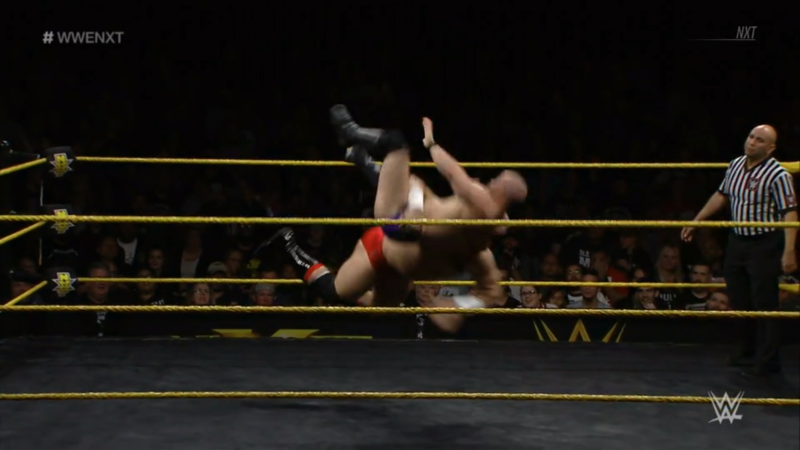 Lars Sullivan VS John Silver; Sullivan wins. Dakota Kai VS ??? ; no contest. 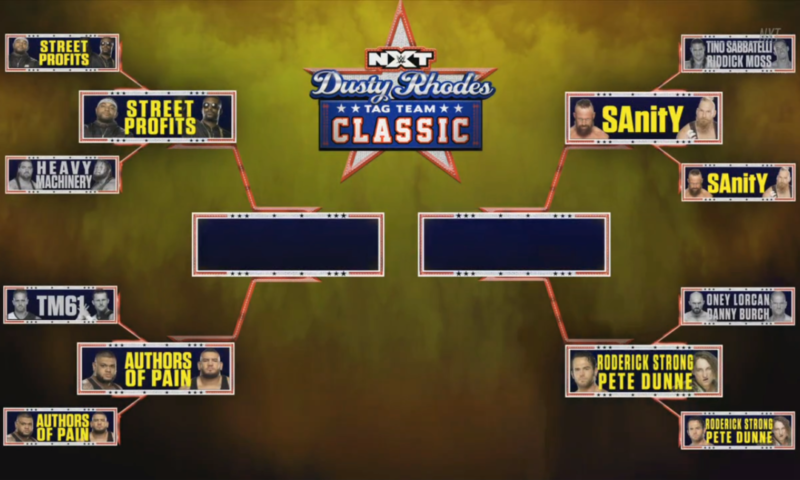 Dusty Rhodes Tag Team Classic Semifinals match: SAnitY VS Roderick Strong & Pete Dunne; Strong & Dunne win and advance to the finals. Before the show, Tommaso Ciampa arrived at Full Sail. The Psycho Killer saw the fans, and the fans saw him. 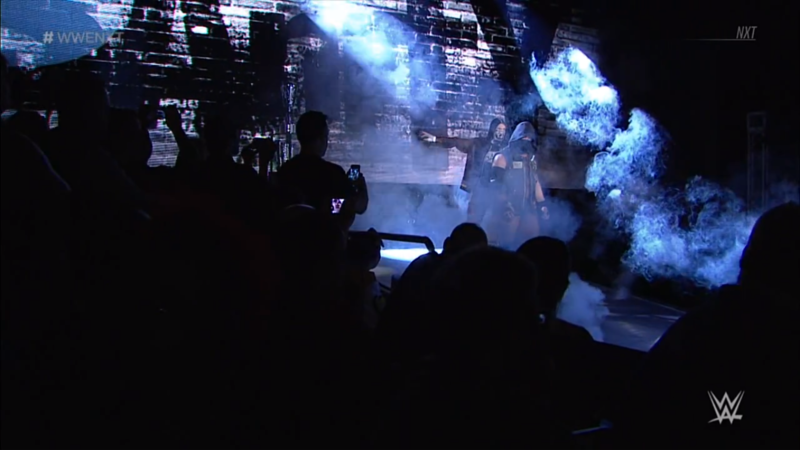 The fans boo and jeer like always, while NXT Media ask Ciampa about his recovering knee. Ciampa refuses to answer, but asks William Regal, “What type of place are you running here?” Johnny Gargano shows up at Ciampa’s place of work and attacks him! Gargano has been stalking Ciampa! Ciampa blames Regal. Regal admits, Gargano is out of order. Ciampa wants to know what to do to get rid of Gargano for good. TakeOver: New Orleans, Ciampa VS Gargano, but it’ll be unsanctioned. Regal knows as well as Ciampa, what “unsanctioned” means. Yes, Regal does. But if Gargano wins, he’s got his job back! Though, if Ciampa wins, Gargano will be banished from Full Sail and NXT for good. NXT Media ask Ciampa his thoughts, but it’s clear from the look on his face what he’s ready to do to Gargano. Will Gargano win back his job? Or will Ciampa crush his former friend under the weight of his grudge once and for all? 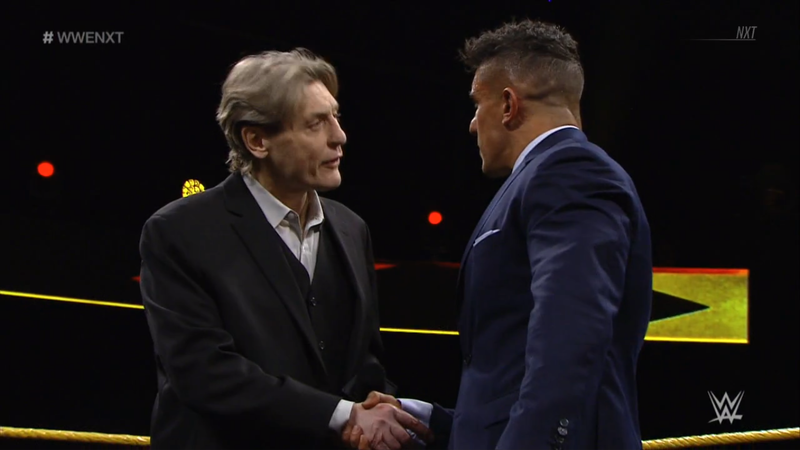 NXT General Manager, William Regal, heads to the ring. He welcomes the crowd to another night of NXT, and says that “week in and week out”, NXT brings us the “very best competitors from aruond the world.” Therefore, there need to be measuring sticks to assess the talent. That is to say, at TakeOver: New Orleans, there shall be a match for the NXT North American Championship. 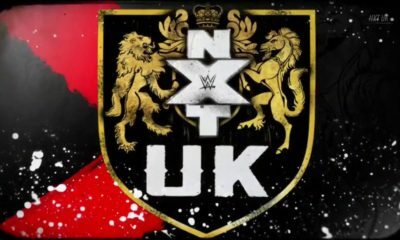 Just as the WWE United Kingdom Championship has brought us Wolfgang, Tyler Bate, Trent Seven, Mark Andrews and Pete Dunne, this NAC will be carried with pride. But wait, who is this coming out now? Regal speaks up, and is himself very happy to see EC3 finally join, but no one is handed anything in NXT. EC3 will have to earn the title, and he’s more than capable. Therefore, TakeOver: New Orleans will have EC3 competing for the NXT NAC, against five other men, in a Ladder Match! The fans like that, but EC3 doesn’t look so sure. Fans chant “Thank you, Regal!”, and EC3 joins in. “Because you can line up five men, 10 men, 15 men”, or even the entire NXT locker room, but EC3 still vows to show the world why he is the Top 1% of the industry. Regal and EC3 shake hands, and the fans cheer, but who will join EC3 in a Six Man Ladder Match for the brand new title? 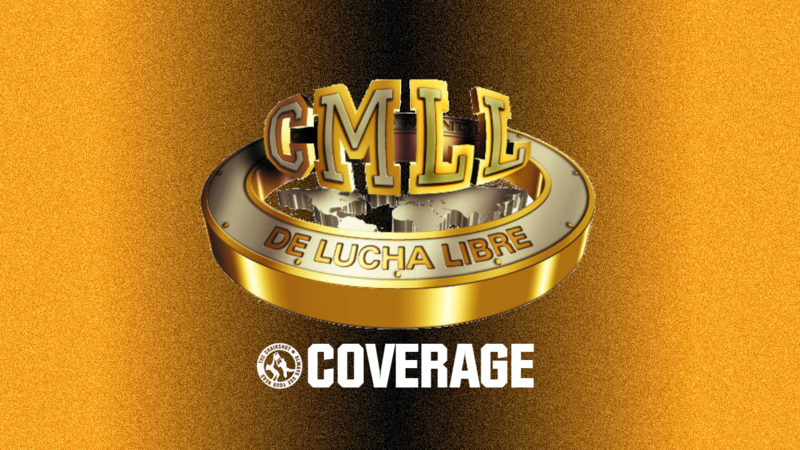 Charly Caruso recaps the Dusty Tag Team Classic. Mustache Mountain was unable to compete as Tyler Bate’s leg injury would not be healed in time. This gave rise to a new team to take on Lorcan & Burch as Roderick Strong would get the British Bruiserweight to join in him battle! Strong & Dunne would get past the one-two brawling combination of Lorcan & Burch, but can this team still keep going against the chaotic combination of SAnitY? Performance center interview with TM61. Wait, something is going on in the background between Shayan Baszler and a trainee. And now Ember Moon comes over? Cameras move to see and hear what’s going on. Ember shoves Shayna, and now it’s a brawl! They bump into the camera man as they spill over! Other NXT trainees and superstars have to separate them. Tensions are running high just 11 days from TakeOver, will either woman keep from burning Full Sail down to the ground before then? 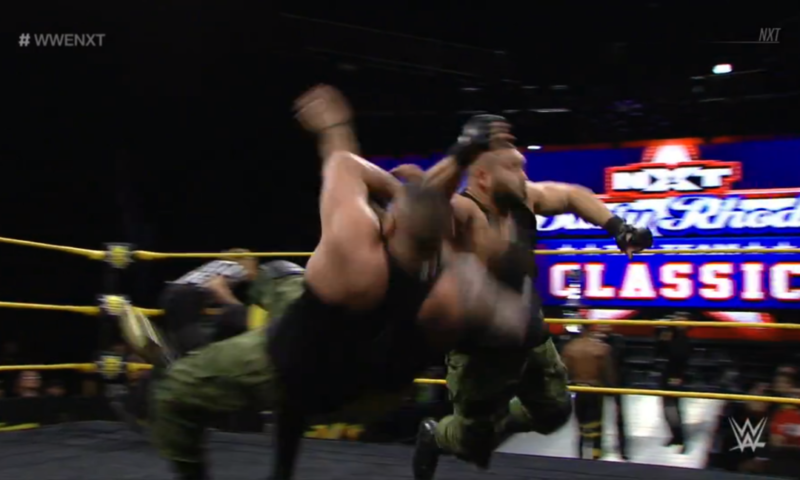 Dusty Rhodes Tag Team Classic Semifinals match: The Street Profits VS The Authors of Pain w/ Paul Ellering! Angelo Dawkins & Montez Ford have the #CurseofGreatness and it’s brought them this far, but Akam & Rezar, who write and illustrate a story of dominance every match they have! 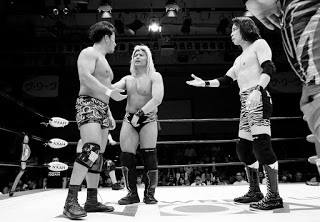 These two teams met once before and AoP won back then. Will they go 2-0 towards another DRC finals? Or will Ford & Dawkins shock the world? Ford starts with Rezar, and Ford says he wants this more! Rezar pie-faces Ford and says about the same in his native tongue, so Ford tags out to Dawkins. Dawkins ties up with Rezar but Rezar powers him to a corner and gives body shots. Rezar sits Dawkins down for knees to his head, then backs off at the referee’s order. Tag to Akam, Akam mugs Dawkins with body shots. Akam rams in knees of his own, then clubs away on Dawkins in the corner. Dawkins gets to an open corner and reverses the whip to dropkick Akam. Dawkins fires off firearms, and a big European Uppercut! Rezar comes in, Dawkins rocks him with another uppercut. He hits Akam with a SPINEBUSTER! The fans and Ford are all fired up now, but Ford ends up face-to-face with Ellering. And he offers him a drink! The fans want Ellering to “Take a sip! Take a sip!” But he slaps the cup down?! Ford has had about enough, but Ellering warns him not to mess with him. Akam clobbers Dawkins, then Rezar returns and they hit Dawkins with the Last Chapter! Ford realizes the mistake he made, and is furious with himself. 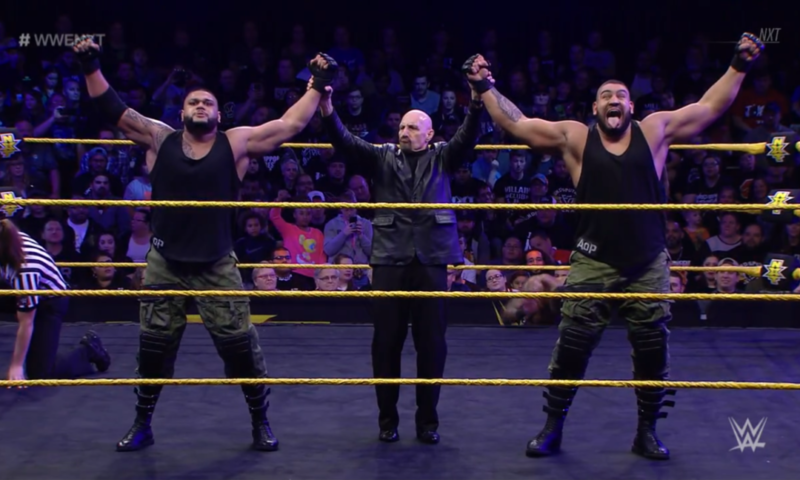 The Authors of Pain are 2-0 on the Street Profits, and could repeat as Dusty Rhodes Classic winners. Who will meet them in the finals has yet to be determined, but will it really matter? Backstage interview with William Regal. 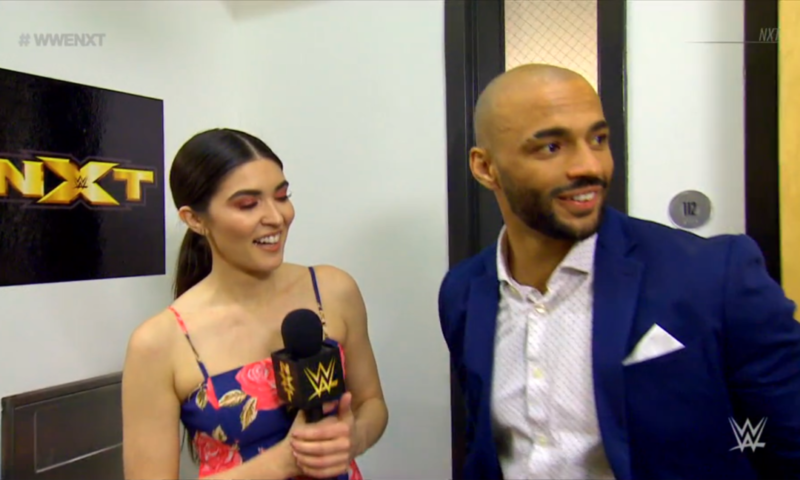 Cathy Kelly asks the NXT GM about his ground-breaking announcement for the Six Man NXT North American Championship Ladder Match. Who else does he plan on adding to this historic match? He just finalized the details on the second man to enter that match, it will be Adam Cole. But then the Velveteen Dream walks over. 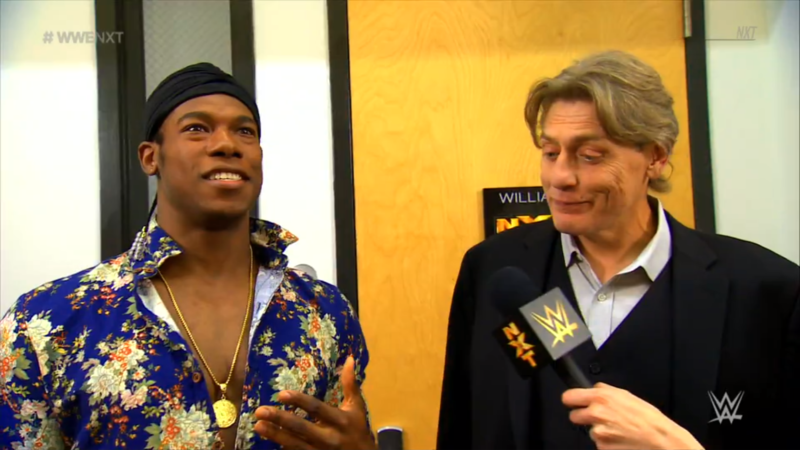 The Patrick Clark Experience compliments Regal on looking well, then brings up the NXT NAC. Ground-breaking, but it’s not an experience the NXT Universe can get behind. But, maybe if Velveteen Dream was in the match, it could be. Regal knows Velveteen has been very impressive since debuting, so he will be the third man in that ladder match. Velveteen knows the NAC broke ground, but putting Velveteen in the match just set the stage. With the field halfway set, how much more star power will be put in this stellar match? 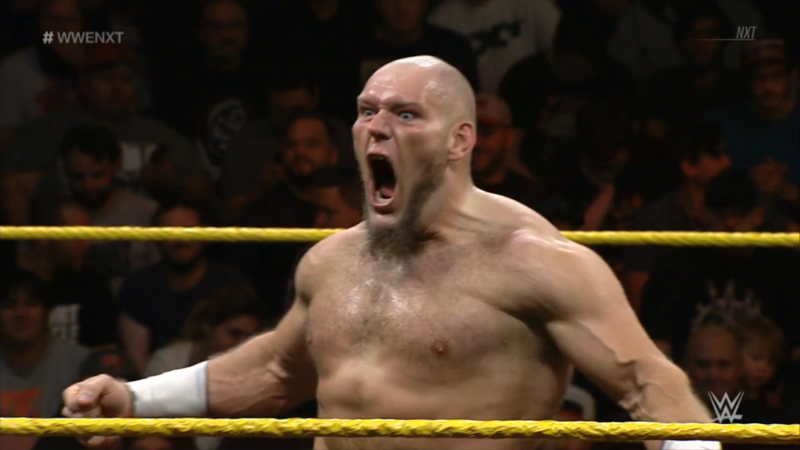 Lars Sullivan VS John Silver! The Leviathan returns! Brilliant yet brutal, intense yet intellectual, terrifying yet tactical. Forget winning, can John Silver even survive the sinister Sullivan? The bell rings, and Silver ties up with Sullivan, only to be thrown down and clubbed into the mat. Sullivan drags Silver up, and throws him hard into buckles! He drags Silver up again for another toss into another corner, but he’s still not done. Sullivan waits for Silver to stand up, to squash him! Sullivan military presses Silver, and then brings him into the powerslam! Yet this is still not the end. Sullivan climbs up to the top rope! For a HUMONGOUS diving headbutt! Sullivan drags Silver up once more, for the Freak Accident! As if there was going to be any other outcome. 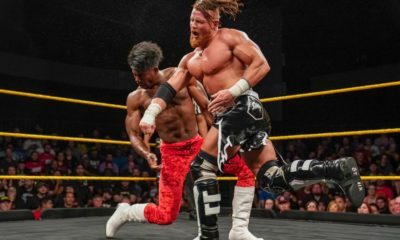 Now that Sullivan has returned, will anyone on the NXT roster have half a chance of stopping him? 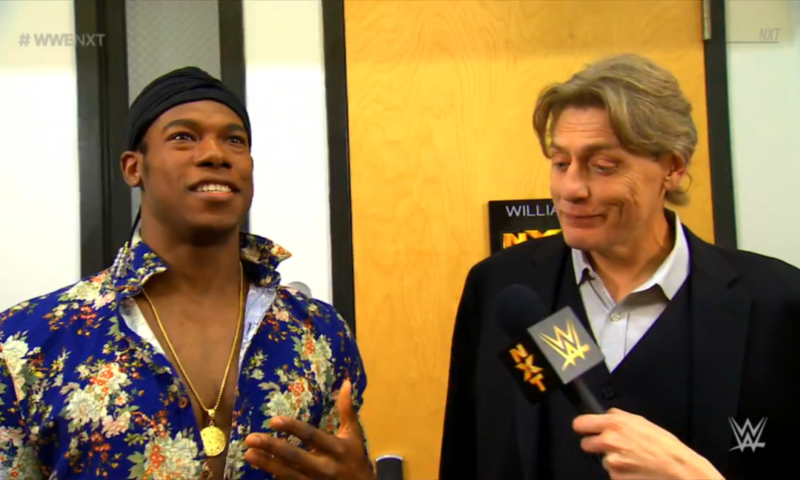 Another backstage interview with William Regal. Three men have been confirmed for the Six Man Ladder Match, but we’re all still curious as to the other three. 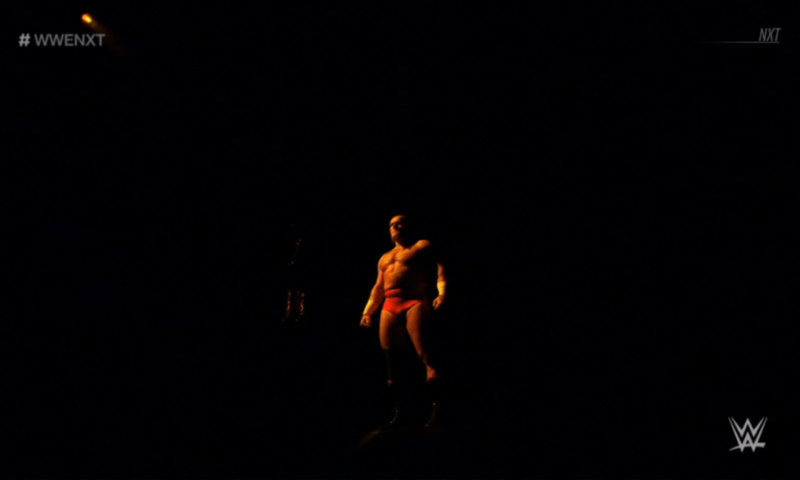 That’s when Lars Sullivan arrives backstage, and Regal congratulates him on his return victory. Clearly Sullivan still has his “appetite for destruction”, and it’s great timing. Regal asks if Sullivan would like part in the North American Championship match. Sullivan says, “That sounds fantastic, Mr. Regal.” Sullivan will “unequivocally and categorically” bring the brand of destruction only he can, but not just with his hands, but with a ladder! That’ll be at TakeOver: New Orleans. Next week, Sullivan wants KILLIAN DAIN! Regal confirms Killian Dain is also in the Ladder Match, so the Leviathan will get a match with the Beast of Belfast. “Good.” When monsters collide, will Full Sail survive?! 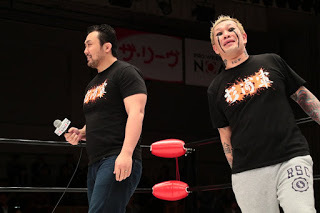 The Captain of Team Kick has fully recovered from the arm injury the Queen of Spades gave her. 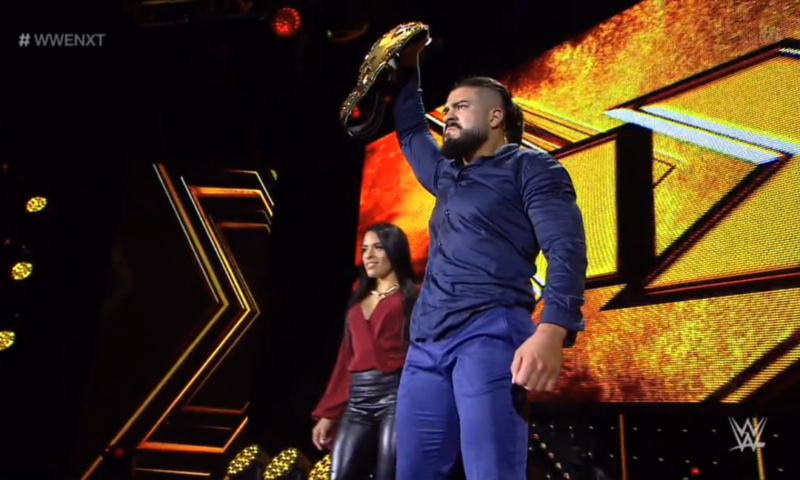 BREAKING: Andrade Almas attacks Aleister Black in the parking lot! El Idolo goes after the Embodiment of the End in an ambush, with Zelina Vega cheering him on! He tells the “perro” that he is going to pay, and then kicks him while he’s down. Vega says, “That’s what you get!” and Almas tells Aleister he will respect the champion! They spot an ice chest, and both Vega and Almas get the same idea. Almas brings Aleister over, and plunges the #1 contender’s head into the chilling water! 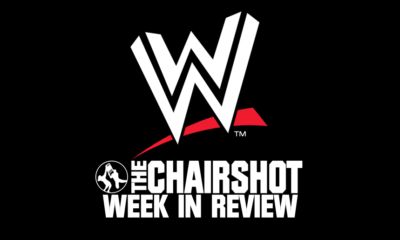 Fans boo and jeer more as Almas moves the chair aside to choke Aleister directly. 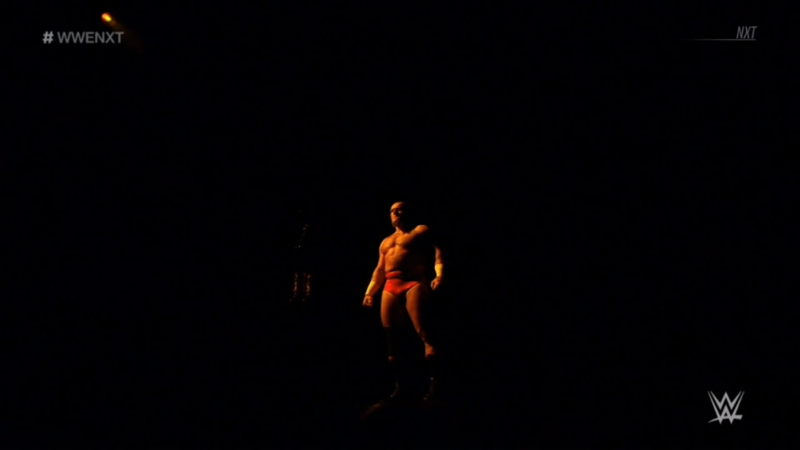 Almas stands over Aleister, title raised above. He and Vega then leave, while referees rush to check on Aleister. 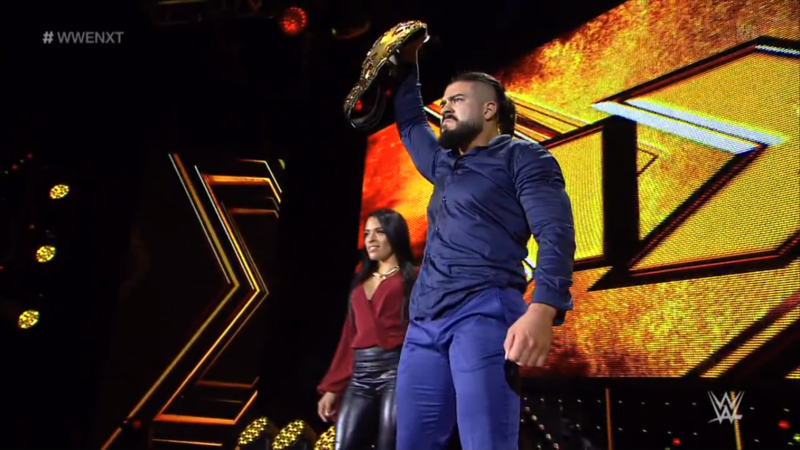 Almas raises the title again on the stage, his message sent. El Campeon demands respect, but will he even have a match after what he did to his challenger? 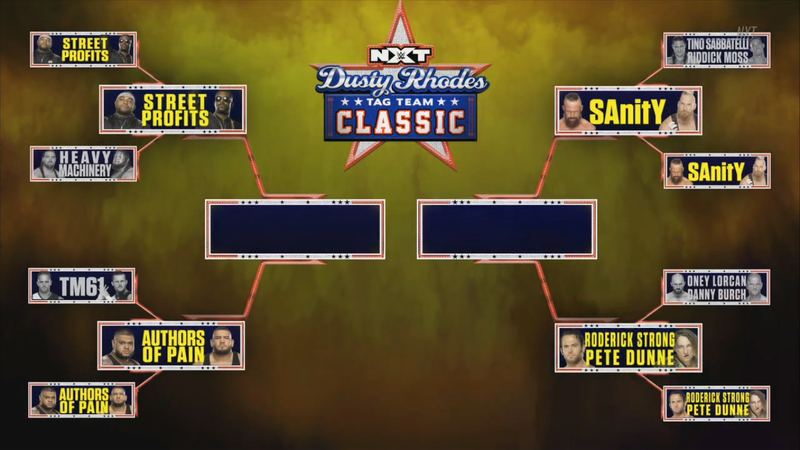 Dusty Rhodes Tag Team Classic Semifinals match: SAnitY VS Roderick Strong & Pete Dunne! 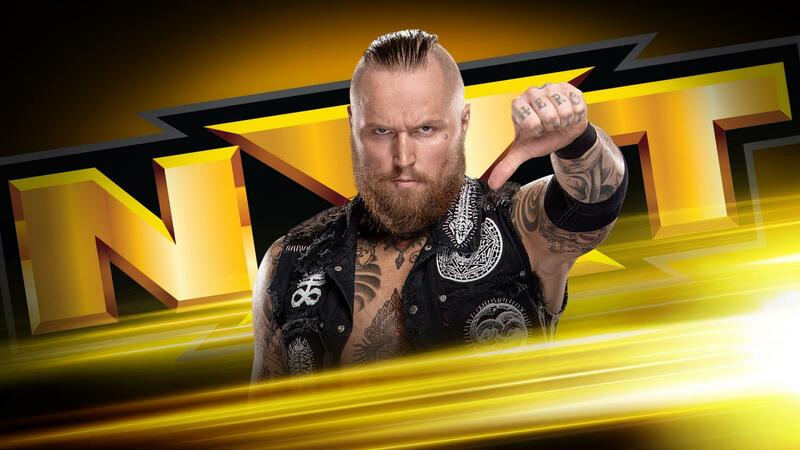 Chaos reigned once before when Eric Young & Alexander Wolfe held the NXT Tag Team Championships before. The Messiah of the Backbreaker wants his first taste of gold, and the Bruiserweight wouldn’t mind having a second belt on top of his WWE United Kingdom Championship. 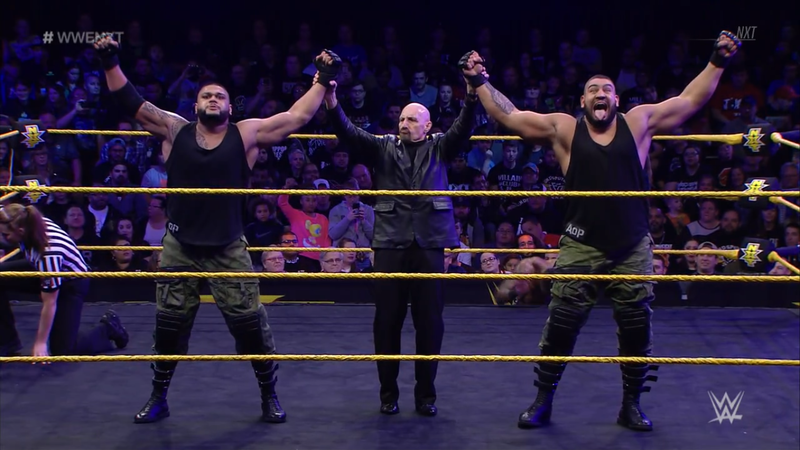 Which duo will win to challenge the Authors of Pain in the finals? Wolfe starts against Strong as the bell rings. The two circle, tie up, and Strong gets around for the waistlock to float into the facelock. Wolfe pushes Strong but Strong pushes back as he shifts into a headlock. Wolfe powers out but Strong kicks his back drop away. Strong runs out but Wolfe scoops to slam him. Dunne and Young come in and it’s a stand-off between all four men. The referee counts and the illegal partners exit. Wolfe and Strong back off and tag in Young and Dunne. Dunne and Young circle, tie up, and move around, going back and forth in the same corner. The referee counts again, Dunne wrenches Young’s arm and goes for fingers. Young reverses to whip Dunne, but then runs into a roll-up, TWO! Dunne kicks Young’s arm out, but Wolfe and Strong come in now. The referee won’t stand for disorder, he tells them to exit. Strong and Wolfe exit, Dunne and Young circle. Dunne whips and runs Young over with a clothesline, then covers, ONE. Dunne whips but Young reverses and clobbers Dunne with his own clothesline, then whips but Dunne reverses. Young goes up and over while Wolfe tags in. Dunne hits buckles, Young puts him in an abdominal stretch while Wolfe runs, Wolfe boots Dunne in the chest! Wolfe rains rights and lefts and the fans applaud while we go to break. 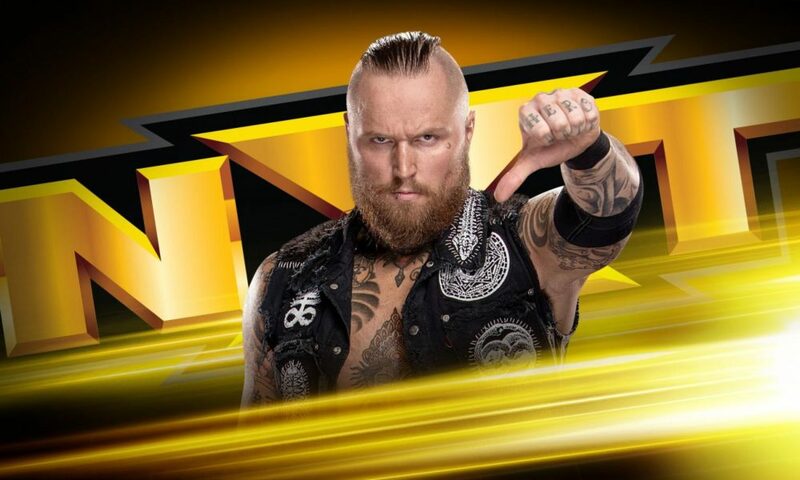 NXT returns once more, and we see Wolfe tag Young back in. Wolfe lifts Dunne in a gutwrench for a gutbuster, Young adds a flying ax handle. Cover, TWO, but Young keeps on Dunne at the ropes. The referee backs him off, Dunne rocks Young with a forearm! Tag to Strong, and Strong stomps away on Young. Strong puts Young in a corner and rams in shoulders before giving a sharp chop. Tag to Dunne, Strong and Dunne each give a chop to Young. Strong lifts Young for a pendulum backbreaker while Dunne hops up, Dunne jumps for a stomp! Cover, TWO, but Dunne keeps on Young with a grounded hammerlock. Dunne wrenches while fans rally, Dunne stretches Young’s free arm back and gives it a hard yank. He drags Young up and whips him to a corner, then gives him a running overhand chop. Dunne keeps on Young with body shots, then whips corner to corner, but Young tumbles to the apron. Young shoulders in, slips under Dunne, but Dunne stomps him out before he can tag Wolfe. Dunne goes after that bad arm more with a bodyscissor and double wristlock! Young endures the hoverboard, then powers out to a suplex! Both men are down while the fans applaud. The fans rally, Dunne and Young hot tag to Strong and Wolfe. Strong and Wolfe throw haymakers back and forth, neither one slowing down, but only speeding up! Strong gets the edge with elbows but Wolfe shoves him away. Wolfe boots but Strong holds the ropes. Strong boots back, but Wolfe EuroUppers! Wolfe fireman carry lifts Strong but Strong slips out, shoves and kitchen sink knees Wolfe against the ropes. Young comes in but Strong catches him with a back elbow. Strong fireman carry lifts Wolfe now, but Wolfe slips out to a waistlock and German Suplexes Strong! Wolfe keeps going, fireman carry to Death Valley Driver! Cover, TWO! It was close, so SAnitY keeps moving. Wolfe tags Young, wheelbarrow lift, EuroUpper, wheelbarrow neckbreaker! Young covers, Dunne breaks it! Wolfe returns but Dunne throws him out, Wolfe manages to stay on the apron. Dunne goes to hit Wolfe but Wolfe hits Dunne first. Wolfe climbs up, but Dunne forearms him out of the air! Young runs at Dunne and hits neckbreaker! Dunne rolls out of the ring, Young gets to a corner and climbs up while Strong stirs. Strong stops Young up top with a right hand and chop. Strong climbs up, but Young fights back. Young throws Strong down with a gordbuster, then adjusts for a Macho Elbow! Cover, TWO, and Young can’t believe it! He argues it out with the referee but it was a two. Young walks over to Strong, Strong kicks out a leg then kicks him in the chest. Strong stands up while Young staggers. Young swings, but gets caught into a backbreaker! Cover, but Wolfe breaks it just in time. Dunne runs in but misses the enziguri. Wolfe grabs him and German Suplexes, but Dunne lands on his feet. Dunne kicks Wolfe in the head, Strong hits him with End of Heartache! Strong gives Young a Shining Wizard in the corner, Dunne tags in, back suplex hand-off into the Bitter End! Cover, Dunne & Strong win! 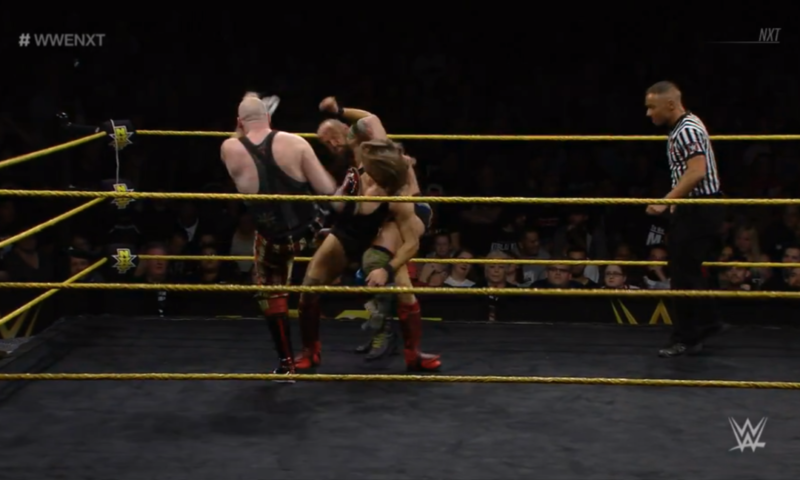 The unlikely duo of the Back Breaker & Bruiserweight have beaten former NXT Tag Team Champions! Can they do it again against the bigger and badder Akam & Rezar next week? One last interview with William Regal. RICOCHET! The fans lose their minds at this other major recruit making a surprise appearance. And in regards to this historic match, ll the King of Speed has to say is, “See you at TakeOver.” The stars are aligning for the NXT’s newest title, who will be the inaugural North American Champion?! To say this was an amazing episode probably doesn’t do it justice. This was another full hour, and the pacing was smooth transition to smooth transition of everything. 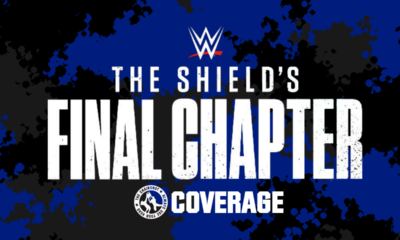 We start with another genius Ciampa promo for fans to shower Heel heat on him, and then we get a no nonsense announcement of the “unsanctioned” grudge match. It’s going to be like their Cruiserweight Classic match but even better. The TM61 segment that becomes a Shayna-Ember segment was also good, it adds to the NXT Women’s Championship story without too much fuss or worry about words. Then as rumored, we get our NXT men’s mid-card title announcement, but it was made even better by the surprise appearance of EC3! EC3 is great on the mic, great in the ring, and he’s a great choice for the inaugural NAC match. In fact, all the choices for that match are great, from Adam Cole to Velveteen to the monsters, Lars & Damo, and especially the final choice of Ricochet. Spreading the announcements throughout the episode was actually rather smart, too, it gives the appearance of Regal negotiating the deals out, and helps add more moments of suspense and surprise. Especially since they got to end the night on the great surprise of seeing Ricochet come out of the office without warning. 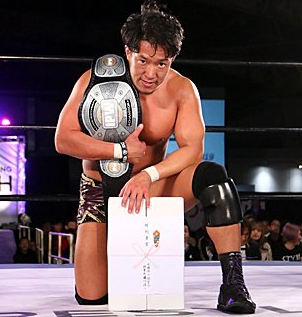 The matches tonight were great as always, with some good surprises sprinkled in, as well. Logically, Authors of Pain win, not that Street Profits aren’t a good team. There was also a nice story building as Ford lets his emotions get the better of him and that costs them. 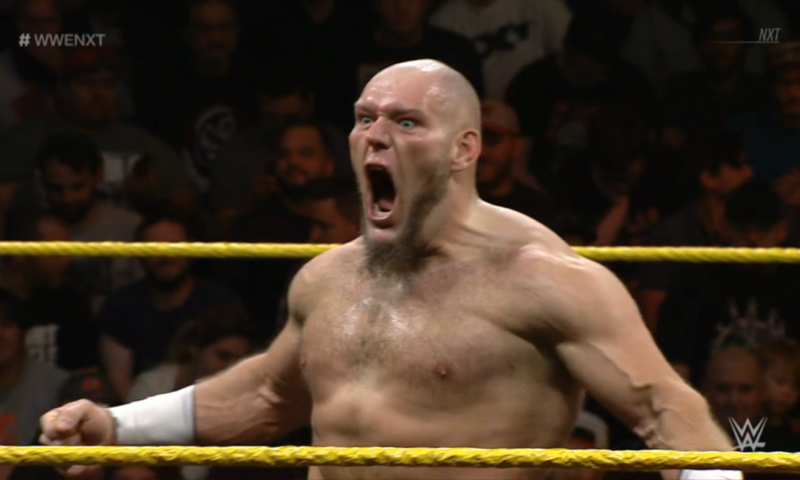 Lars Sullivan wins because duh, he’s Lars Sullivan. I thought it was brilliant Dakota Kai appears only for her not to wrestle at all, and Almas is even more Heel with his beat down of Aleister. Then another surprise, Dunne & Strong win again. They might win it all at this rate, which will work with Strong’s story of always opposing the Undisputed Era. It’s a shame Bobby Fish got hurt, but word is that Cole might do double duty under Freebird Rules, so it still works.